Why would I need self storage in San Francisco, CA? There are a variety of reasons why you might need self-storage in San Francisco, CA. How much is a storage unit in San Francisco, CA? The cheapest storage unit in San Francisco, CA is $84.00 per month. What size storage units do you have available in San Francisco, CA? In San Francisco, CA we have sizes that range from 3'x4' to 10'x28' to suit your storage needs. How much is it for a 3'x4' storage unit in San Francisco, CA? The cheapest 3'x4' storage unit in San Francisco, CA is $87.00 per month. San Francisco is a Northern California city famous for its rolling fog, colorful Victorian houses and the iconic Golden Gate Bridge. It's an epicenter of commerce, finance and culture, and one of the most densely populated areas in the nation. The city has seen a steady rate of growth over the past few decades, thanks to its variety of jobs, diverse economy, with support from tech companies in and around the area, and a huge variety of local attractions. Europeans first settled in San Francisco in the late 18th century when Spanish forces established the Presidio Army Base. When prospectors struck gold in the area in 1849, the population exploded. Within a year of the discovery, the city went from about 1,000 people to over 25,000, with treasure-seekers coming from all over the country. Many well-known entrepreneurs, including Levi Strauss and Dominic Ghirardelli, moved to the area to make the most of the Gold Rush and San Francisco prospered. When the gold frenzy began to calm, silver was discovered. This fed the area's economic prosperity, making it possible for its development to continue, while many other regional towns failed. Today, San Francisco is a hub for technological innovation, with recent booms fueled by the growth of internet and other tech companies. It serves as a popular residential area for people working in nearby Silicon Valley and continues to produce artists and other creatives in a wide range of fields. 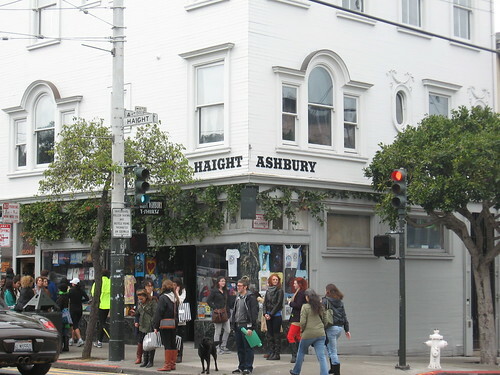 The "City by the Bay" is also famous for its activism and as the home of the beat poets, who moved to town in the 1950s and made their home at City Lights Bookstore. The establishment still opens its doors to the public on Columbus Avenue, at the intersection of the popular North Beach and China Town neighborhoods. San Francisco is considered such a desirable place to live that real estate prices have been rising steadily since the 1980s. Mild weather, a variety of jobs and many local amenities attract many new residents every year. In some ways, San Francisco's popularity can make it a difficult place to live. It has an extremely high cost of living, higher than both the California and national averages. One of the biggest factors that attract people to San Francisco is its highly diversified economy, offering a huge range of jobs in a variety of fields. The largest industries in the city include tourism, technology, finance, business and government services. San Francisco's high cost of living is somewhat offset by its higher than average income levels, making possible a comfortable life in the city, if you have the right job. The city is also one of the most beautiful, with steep hills affording views of the bay and lush landscape and parks that make it a great city to explore on foot. Union Square offers one of the largest collections of shopping, dining and cultural destinations in the country, making it very popular among tourists and locals alike. The neighborhood was named for the rallies of Union soldiers held in the area before the start of the Civil War. The Mission District is known for its rich Hispanic culture, which has infused the neighborhood's art, dining and music scenes with a distinctly vibrant spirit. Many impressive murals are scattered throughout the neighborhood, many of which were painted during the 1970s Chicano art movement. Serving as San Francisco's central business district, the Financial District is home to countless financial institutions, corporate headquarters and law firms. Skyscrapers line the neighborhood's streets, which are also dotted with several historic buildings, including the 1920s Standard Oil Building. Italian fishermen, who made their living on the area's well-known Dungeness crabs, originally established this waterfront neighborhood that is now very popular with tourists. The local Pier 39 is home to a colony of sea lions, which have been residents of the wharf since the late 1980s. The San Francisco Unified School District, which operates a large number of elementary, middle, high, magnet and charter schools, serves San Francisco. There are also over 100 private schools in the area, many of which are faith-based. If you're considering pursuing your college degree in San Francisco, you have plenty of schools to choose from. The University of California,San Francisco, is home to one of the top medical schools in the U.S., and San Francisco State University offers degrees in a variety of fields. You'll also find a number of specialized schools with programs focused on art, science and culinary education. Utilities: The San Francisco Public Utilities Commission manages water, sewer and electricity services for the city. Garbage and Recycling: Recology San Francisco curbside collection of trash and recyclables also offers bulk pick-up upon request. Transportation: San Francisco has a well-developed network of public transit, providing convenient access to much of the city via subway, light rail, bus and cable car. The Bay Area Rapid Transit (BART) is another transportation option for many commuters in and around the city. Historically, there has been a large range in housing prices among the many neighborhoods of San Francisco. However, in recent years, the high demand for housing has driven the median home and rent prices significantly higher in all parts of the city. The overall cost of living in San Francisco is much higher than the national average. Our lowest priced units in San Francisco, CA average $102.43 per month. 535 people have reserved units in San Francisco, CA in the past 30 days. There are 7 locations within San Francisco, CA's city limits. There are 2 locations in San Francisco, CA that offer AC and Heating features.